Mother’s day is just around the corner and it’s time to bust out those handmade Mother’s day gifts. Today’s kid friendly Mother’s day art project is a great way to get the kids involved in the gift making, whether it is Dad trying to make something special for mom or mom and the kids making it for Grandma. Either way the kids will have fun painting up a storm and the end result is something worthy of being hung on the wall. 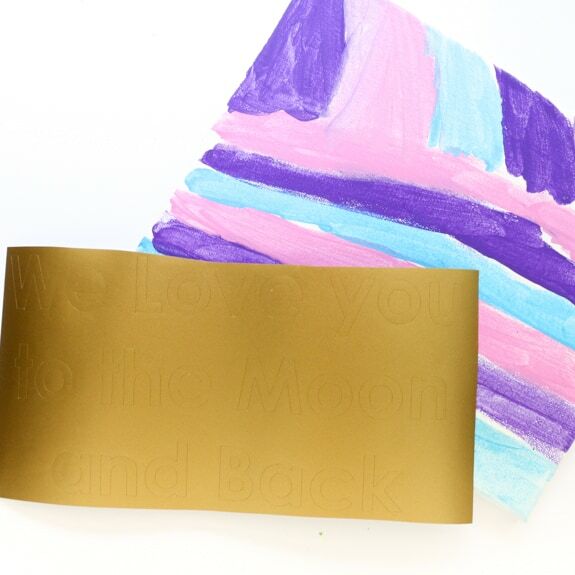 As you can see the project really lets kids create their own masterpiece however the want, then with a bit of cut vinyl, you can transform the art into the perfect Mother’s day gift. 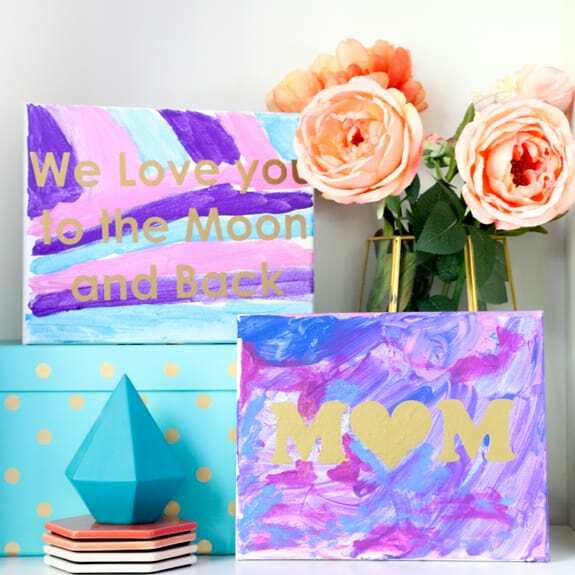 I know that I, Kara, would love to get a few of these canvas art prints to hang up for Mother’s day! Let’s get started making a few kid friendly Mother’s day art pieces now shall we? The first step is easy enough. 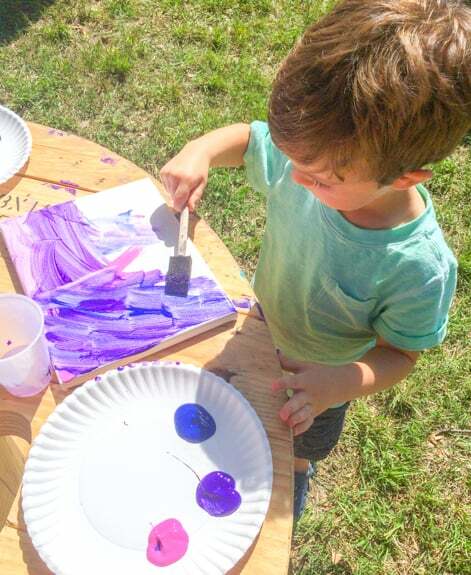 Just squirt some paint on a paper plate and let the kids go to town covering that canvas. Once they have their art work completed, let it dry while you prepare the vinyl. 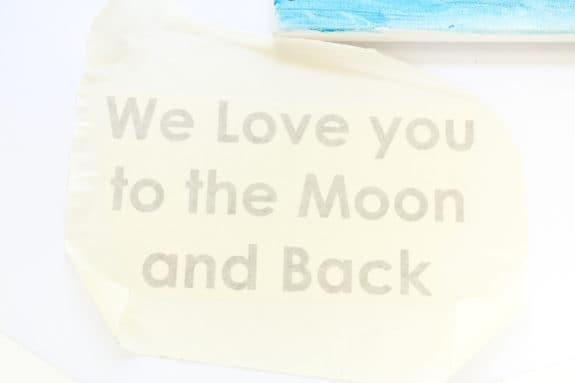 For my vinyl wording I went with a saying that we use a lot around our house, “I love you to the moon and back”, but modified it to “We” since it would be coming from the family to mom. I also went simple with “Mom” using a heart instead of the “O”. You can download the PDF with the lettering I used to make it easy for you. Or if you want a challenge, create your own text with a saying that has meaning to your family. 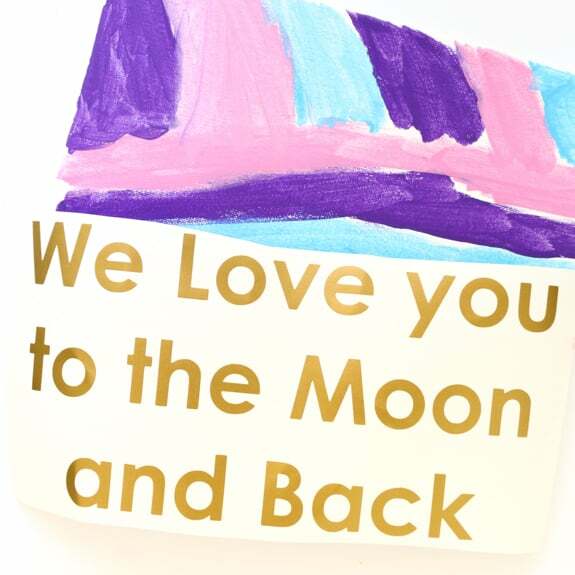 Once you have your text image loaded into your cutting software, go ahead and cut it out of the gold vinyl a few inches smaller than the size of your canvas. Now you will want to remove the extra vinyl around the letters and place a piece of the vinyl masking paper over the letters, sticky side down. Once you have that step complete, remove the paper backing from the vinyl and the letters should be stuck to the masking paper. 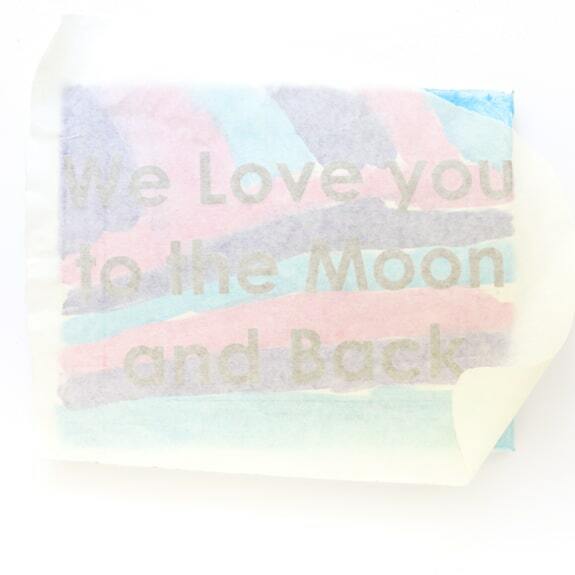 If not, simply use a credit card to rub on the masking paper over the letters so that they stick. Then remove the backing paper. 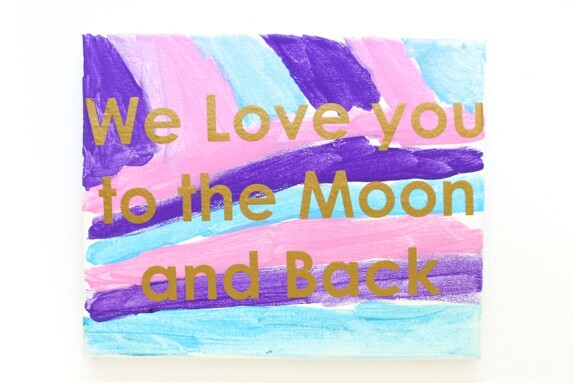 Place your masking paper with the letters attached onto the canvas and use a credit card to rub over the letters so that they stick to your canvas. Now gently peel back the masking paper and your vinyl letters will be stuck to the canvas. That’s it! I love the gold lettering over the kids art work. But if you are not a fan of gold you can always use white vinyl instead. I love how different each piece of art is depending on which kid made it. I also really love the idea of asking the kids what they want the canvas to say. How fun would that be? I hope you enjoyed this easy kid friendly Mother’s day art. For even more crafts and DIY ideas, head over to my blog, A Kailo Chic Life. Hi! My name is Kara and I am the owner and creative force behind A Kailo Chic Life. I am a mom of two and I love all things bright, colorful, and patterned. I love interior design, crafting, DIY projects, gardening, and baking.